Cindy Depice and cousin Kate Mundell passed on their creations. turns white, quickly wipe away with a paper towel. Set aside. in a saucepan with ½ cup water and bring to boil. Simmer 3-4 minutes. In a separate bowl, mix cornstarch and 2 tablespoons water until smooth. Add the cornstarch mixture, ½ cup sugar and lemon juice to saucepan and stir until the sauce thickens, about 1 minute. Pour the hot sauce over the fresh blueberries and stirgently until all the berries are coated. 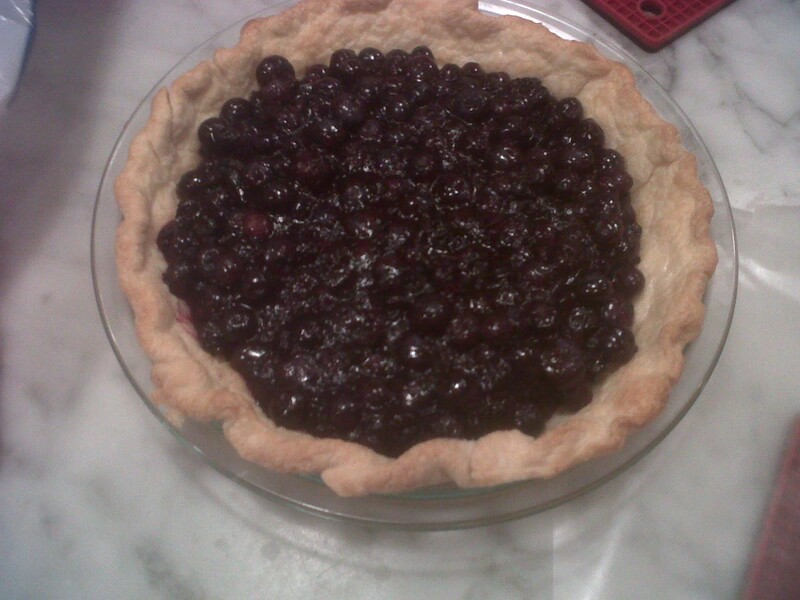 Pour blueberries into pie shell and let the pie set up for 2 hours at room temperature. Serve with crème fraiche, whipped cream or ice cream. This pie will keep for 2 days but is best the day it is made. Line a cookie sheet with parchment paper, foil or silpat. Set aside. Place butter in a medium saucepan and brown. My tip on browning butter: set the heat to medium and let the butter melt; it will be splattering so you may want to put the lid on but leave a small crack open; you can swirl the saucepan once in a while; as soon as the butter calms down and the noise dies down – start watching the butter, it will brown quickly from this point; the nutty fragrance and dark brown color is what you want. Take of the heat and let cool for few minutes. To distract yourself, place egg and egg yolk in a small measuring cup and slightly beat with a fork. Set aside. Pour the butter in a large mixing bowl and let cool few more minutes. Add brown sugar and granulated sugar and mix on low or “stir” ( for those with standing mixers ). Add the eggs and vanilla and mix until smooth, about 1 minute. Now switch to a wooden spoon or a spatula. Add the dry ingredients all at once, following by the chocolate chips. Now gently fold it all in, until a uniform dough form. It will be quite dry and crummy. Place the dough in the fridge for 1 hour. Scoop the dough out with a cookie scoop or a tablespoon and roll into a ball in your hands. Place on a prepared cookie sheet. 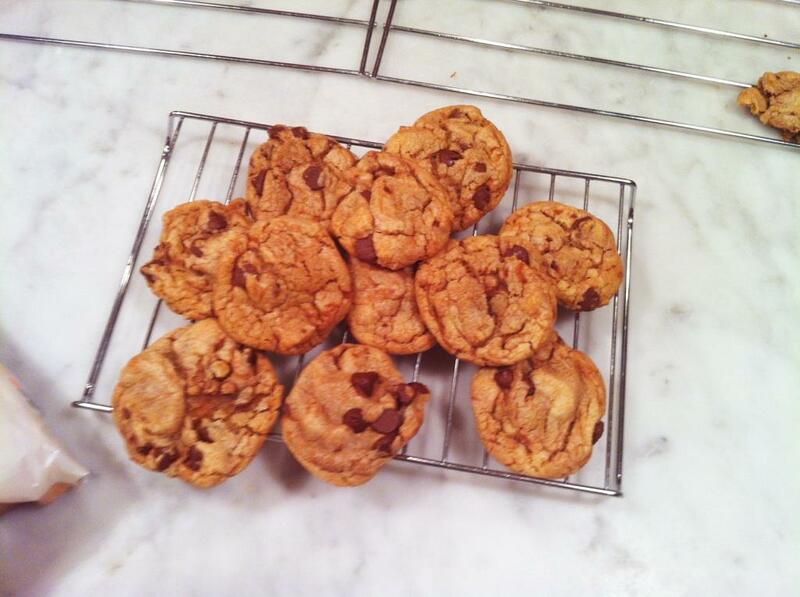 Bake for 5 minutes, pulled it out, flatten the cookies with the back of a metal spatula and return to the oven. Bake additional 5 – 6 minutes. Cool on a sheet for 1 minute and transfer to a wire rack to cool completely.